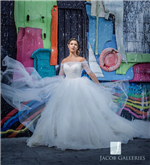 Our large & modern boutiques specialize in selling designer overstock bridal gowns off-the-rack. We carry dresses from the designers you know, love and want to wear on your wedding day at prices that are always 30% - 80% below retail. Visit us for a high-end boutique experience without the high-end price tag. Find the gown of your dreams at Davids Bridal! Choose from hundreds of exquisitely crafted styles in 2 - 18 and 14W - 26W. You will also find everything for your entire bridal party including beautiful dresses for brides, junior bridesmaids, mothers, flower girls, and special occasions. Make your appointment today! Modern and unique designs fit for your wedding! 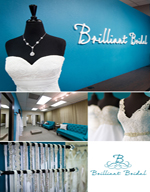 Silhouette Bridal is truly unlike other bridal shop, it is your place where a dream will come true for all the brides. Brides know that when they will visit silhouette Bridal, they will experience completely up-to-date selections, many times the selection of the average bridal shops. Expect the best service, the best fit, and the best collection of wedding dresses, bridesmaid dresses and designer and wedding accessories, our selection of bridal gowns, bridesmaids’ dresses, mother of the bride gowns, mother of the groom dresses, and flower girl is unsurpassed. On site custom tailoring and alterations is available by true professionals. The finest selection of suits, tuxedos and accessories for the groom and all his men. Shop 2 Las Vegas locations plus convenient locations throughout Southern California.